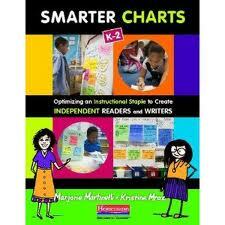 Smarter Charts: Here, There, and Everywhere! Wow! It is hard to believe that the 2014-2015 school year is already well under way. We at Chartchums have been busy getting back into the classroom, putting the final touches on a digital course about charting for the Heinemann Digital Campus, and welcoming our newest book, Smarter Charts for Math, Science and Social Studies: Making Learning Visible in the Content Areas into the world. This book is the perfect companion to our original Smarter Charts book where we first showed you the why of charts and the nuts and bolts of charting. It also continues the charting conversations we engage in here at Chartchums. In our latest book we build upon our original charting foundation and go even deeper into the different types of charts and how they can support instruction, no matter what you are teaching. This book goes beyond literacy and will show you how to turn complex ideas into kid-friendly visuals, help children internalize complex processes, and even increase your instructional time, no matter what the content area or subject you are teaching. In addition to the introduction, appendix, and bibliography, there are five sections that define and illustrate each type of chart and how it can be used to clarify and energize your teaching, showing you how you can . . . Make learning visible in the content areas! This week we will focus on Routine charts since they are such an integral staple at the beginning of the year. Routine charts make clear the expectations and help kids know what to do and how to do it in order to be productive, positive, and proud throughout each and every day. For example, playing math games. Teaching the routine of deciding what to play, reading the rules, setting up the game so you can play, play, play, then not to forget the clean-up at the end. 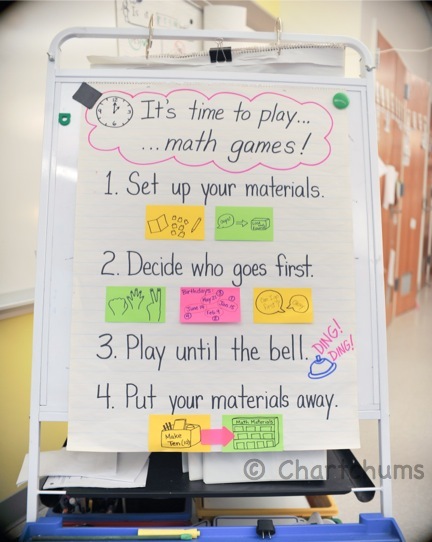 The chart helps remind children of the steps that will allow them to participate in math games smoothly, allowing more time for playing and fun. Routines help insure that games are played well and for fun. What about the routines that have to do with the basic smooth functioning of the classroom and the maintenance of materials? Think about all the materials we put out for our students to use. How often do we assume our kids know how to use them, or better yet, know how we think they should be used. Instead of getting upset, plan on teaching into the ways we want to see these materials used. One typical routine often pertains to the use of the hand sanitizer. Every year we think we can simply put out this important sanitary tool and all germs will go away. What we often forget is that kids often see this gelatinous substance as a fun sensory thing worth experiencing ‘hands on’ and spreading the fun around. Teaching explicitly into how to use this key tool can save not only time but money. The steps for using hand sanitizer also reinforce expectations. Another routine that needs to be taught explicitly is how exactly to put materials away. Whether math, science, reading or writing, there should be a routine that helps everyone end the workshop efficiently and quickly. One important thing for students to learn is how to put books away, especially at the start of the school year. 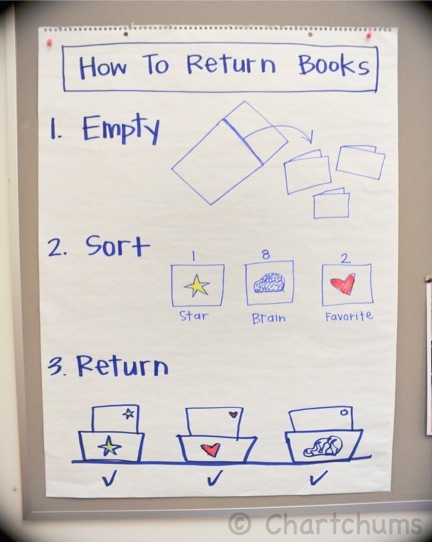 This chart was one Kristi created with her Kindergarten students for returning books to their proper homes in the library. 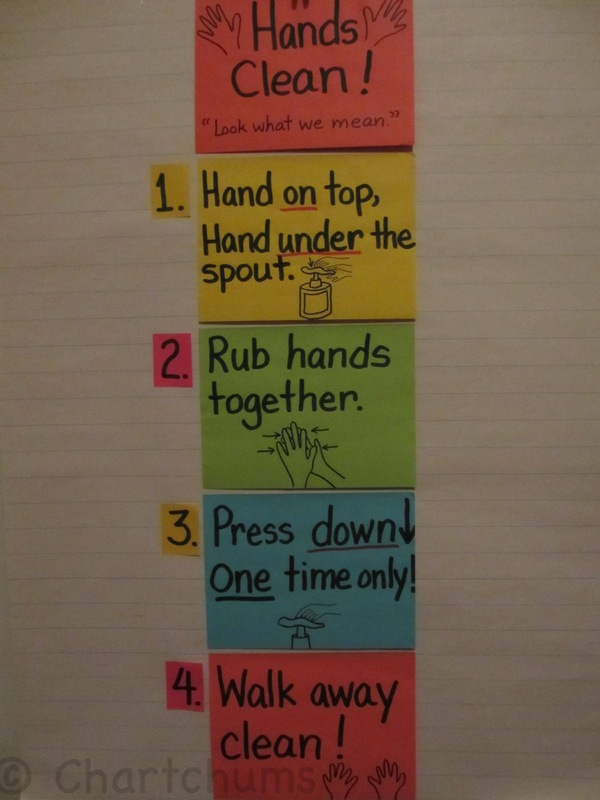 This chart reminds children of the steps for retuning books in a way that will help maintain the class library. Routines may seem simple and easy, but routines only get that way by teaching each step explicitly, providing many opportunities for practice, and providing visual reminders of those steps. Routines, like anything important, are worth charting with the students in order to be for the students.